Being amongst the renowned organizations, we are highly involved in rendering high quality Acid Zinc Electroplating Service. The provided services are rendered with high precision in compliance with industrial quality guidelines. With immense experience in the field, we are able to offer a wide range of Acid Chloride Zinc Plating that are highly appreciated by industry experts. Being a quality conscious company, we make no compromise on quality perspectives and deliver the quality oriented products. 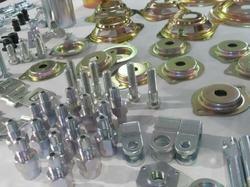 We do acid zinc plating service in fully automized system. Acid-Zinc Salt A. >Acid-Zinc Salt B. For make-up of the solution for zinc plating. >Acid-Zinc Brightener R (Regular). >Acid-Zinc Brightener M(Maintenance). Used for obtaining bright deposites of zinc on works. Application: Blue Passivate for Cyanide, Alkaline and Acid Zinc Coatings. Features/Benefits: Trivalent Chromium Blue passivated Suitable for Zinc deposited from Cyanide, Alkaline Non Cyanide and Acid Electrolytes. It produces Bright Blue Protective Coatings.